As the premier DMC in The Bahamas, we are always on the look-out for prodigious talent, be it the visual, culinary or musical arts. 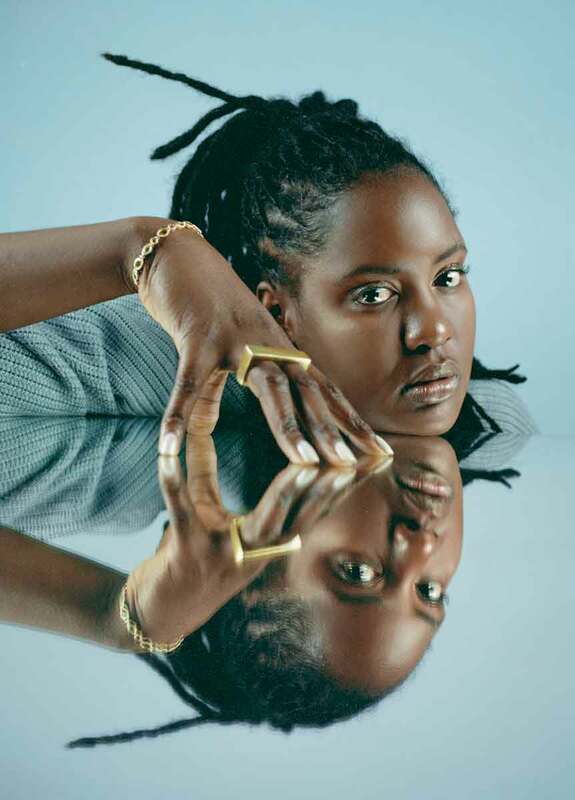 Following in the success of our first musical Artist In The Spotlight - Bahamian trumpet prodigy Giveton Gelin - I am thrilled to introduce the defiantly-undefinable Bahamian-Jamaican 'fusionistic soul artiste' Kamilah, blazing a trail through the New York City music scene. Cacique. How did you get started with music? Kamilah. My music education definitely started with my mom. She isn’t a musician herself, but she is a big music listener. More often than not, there was music playing in my house. I have been in and out of music lessons since age 5 (I started with piano and played violin for a little over a year then moved to guitar). I started a band with some friends in 4th grade; we called ourselves ‘Fire’ - I wrote a few of my first completed songs for the band. I participated in musicals and took part in music competitions in high school and continued playing guitar and writing once I started university. I’ve always loved music. A nightmare for me is a world without music. Original song '1600 Miles' written and performed by Kamilah Gibson. C. How would you describe your sound? Have your musical inspirations influenced your sound or artist individuality? K. Fusion - like so much of the music in the global soundscape these days. I love experimenting with sound and rhythm and melody. My music is soul music… a little jazz, a little folk, a little electronic/ alt R&B. I’m influenced by Reggae/Dancehall, Junkanoo, Hip Hop, and traditional African percussion, among other things. Somewhere along the way, people will decide what they hear. I just want to make people feel. Sometimes music helps us learn something about ourselves we didn’t know before. I just hope to connect with people. C. Who was your greatest musical inspiration growing up? 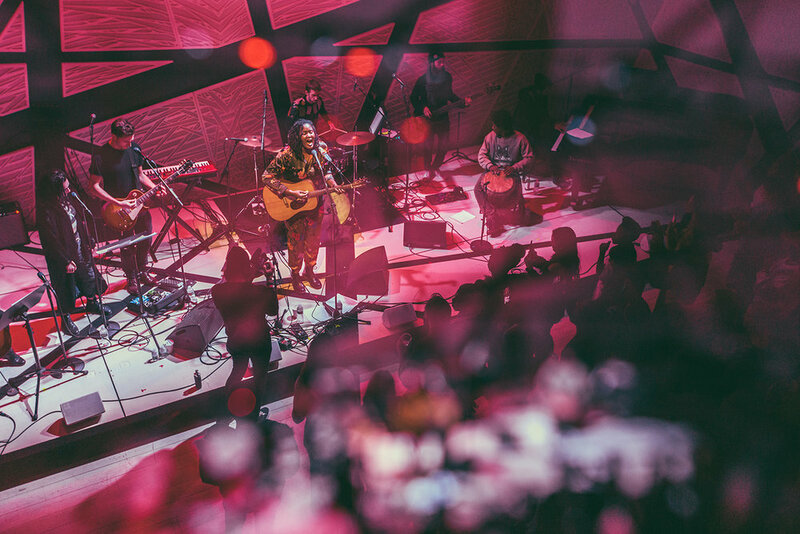 Kamilah connects with crowd at National Sawdust in Brooklyn, NY. Kamilah feeling herself at the National Sawdust in Brooklyn, NY. C. We understand you're half Bahamian and half Jamaican. Has that played a role in defining who you are as a musical artist? K. Yes. I’d say so. Being a composite of both, living in a household that in many ways felt more Jamaican than Bahamian, and living in the Bahamas for so much of my life really influenced my understanding of my identity. There is a lot of me, my stories, in the music - it’s inherently connected to my identity and what I’ve been exposed to having that dual cultural experience. C. Describe your creative process. K. Since moving to New York, I find I write on the move a lot more than I used to. Before, I used to be able to sit still for hours working on a single idea. Lately, I’ve been writing bits and pieces on my daily commute, at other concerts. Whenever inspiration strikes, I either write it down in my notebook (I know it’s analog but pen and paper are still my preferred way of writing), or type it into a note on my phone. I also record voice memos for any instrumental ideas. At some point, I look at my notes, listen to the memos and string ideas together. That’s when I introduce my guitar and piano. I’ve been learning how to produce, too, so that has helped me flesh out those ideas. I’ve also recently started looping - using my voice, instruments and objects around me to build sonic worlds for lyrics to live in. The creative process can be quite meditative and I like to leave elements of that in the final songs. I like the idea of people getting lost in the music the way I can when I write it. It’s like we’re figuring it all out together - learning who we are at the same time. I also co-write with other artists. Sometimes we work with an idea one of us has already started; at other times, we start from scratch and build together. It varies, depending on who I’m working with. C. What is the direction of Bahamian music? Who should we be looking out for? K. There will always be a space for traditional Bahamian Rake n’ Scrape and Junkanoo - it's part of the DNA of our music. I do feel that the more globalized our culture becomes and the more we are influenced by other genres, the more opportunity there is for interesting fusions sprinkled with each artist’s individual flavor. Judah the Lion is a favorite of mine. His music has notes of reggae and hip hop but his accent is definitely unapologetically Bahamian. Keeya is also great! Her vibe is more sultry and lives in an alternative R&B kind of space. She is also a visual artist, so I’m interested to see how she marries the two. Von Trapp is another talented creator. His ad-libs are really creative - his vibe is more trap/rap, as his name would suggest, but he incorporates Bahamian phrases in such a seamless way. Then there are artists like Bodine and Patrice Murell whose music takes traditional sounds we’ve all grown up listening to and puts them in a more contemporary space. Dyson Knight and Wendi have a R&B, soca, Rake n Scrape fusion in their music too, which is really cool. The band Foreign Sounds offers a really cool fusion of alt-rock and soul - I'm looking forward to hearing more from them. R&B/Pop writer Rashad Leamount is a strong writer. He and Keeya collaborated on her single "Faded" which has done really well in International writing competitions. I'm sure there lots more good stuff on the horizon for all of them. I love how diverse the scene is getting. C. What are you doing to push this scene forward? Any new projects on the way? K. Much of 2017 was spent in the studio. I have a lot of music being released this year. On February 2nd, 2018, I released my first song ‘So Long’ featuring Sho, a Brooklyn-based artist-producer. There is more to come, including a video and an EP. I’ve been working with Maria Govan, a Bahamian film director, and a completely Bahamian cast to shoot a music video that will be out later this year. I think because the Bahamas is such an intricately woven part of my identity, I want to carry elements of home visually and sonically in my music - reimagine how more traditional sounds can find a home in my fusionistic approach. Original song 'So Long' written by Kamilah Gibson and Sho Ishikura, performed at National Sawdust in Brooklyn. C. What message does your music generally reflect? Is there a specific theme you sing about or do you sing about whatever is in your heart? K. I think the message changes from song to song. I’m a pretty introspective person. I like to understand people’s motivations. I also like using music as a vehicle for understanding myself and others, the situations people find themselves in, the feelings behind interactions. In the work I’ve been recording, I cover themes like colorism, loss, love, identity and more existential things... whatever is in my heart at the time. C. What it's like being in the cultural melting pot of New York city? K. New York is a great place to find yourself. You’re surrounded by so many different types of people. It feels like there is something for everyone here. There is always music to listen to, classes to take, songwriting workshops to attend, ways to learn new things. I think having access to emerging art/artists (visual artists and musicians alike) has been one of the biggest benefits of being here. It is easy to feel overwhelmed when you first move to NY, but as you find yourself - really figure out what you like and want to pursue, no matter how niche it may seem - and work on your craft, your world gets smaller. That has been great to experience first hand. C. Now just for fun... Covers or originals? K. Originals! Covers are cool but only if the person covering makes it their own. C. Sky juice or daiquiri? K. Sky Juice! Daiquiri's have changed since I was a younger - not every daiquiri is good these days. But it’s hard to go wrong with Sky Juice. C. Scorch conch or conch salad? K. Neither if I’m perfectly honest. But mention cracked conch or a conch burger and I’ll start salivating! Haha. At Cacique, we love to showcase our colourful art scene and the characters that create its distinct flavour - even the flavor. For more information on our featured artists, to arrange a Bahamian art / music experience or to find out about curating a unique sound for your event, feel free to contact us.